I was blessed to bring my family up to the Okanagan via the Coquihalla Highway for some awesome sightseeing. Have always been in awe of this highway from the first time I drove it, in its early construction. I no longer live in Canada since 1994, but I get back to BC regularly as all my immediate Canadian family lives there. What a difference to a MB girl it is, to compare this highway to ones in MB! 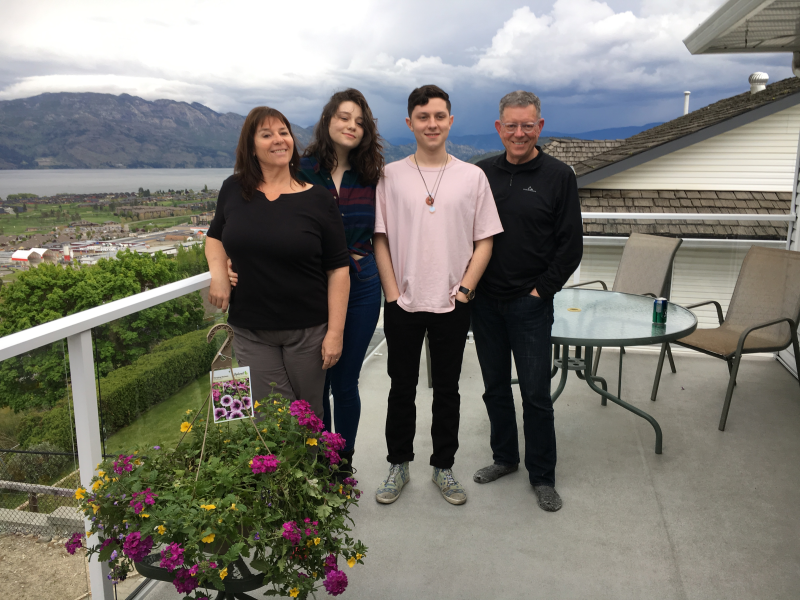 The pic I selected to display shows my family, enjoying the beauty of Lake Okanagan, from my Mothers' deck, it was a chilly day, but we've experienced some awesome weather and family memories here. There is always an abundance of scenery, fruit, wine, Timmys coffee, and tons of family and friends to share this with. On this particular weekend, it snowed on the Coquihalla as we were venturing eastward near the 4,000 foot summit. I have been blessed to live in some beautiful and wonderful places in the USA...northern California, Montana (experiencing the majesty of Yellowstone and the MT side of Glacier (still can't compare to the beauty of Banff and Lake Louise), the eastern shore of Maryland, watching my Canada geese fly home. Now I live in WA state and enjoy another bounty of beauty. With all these blessings, I am still a proud Canadian girl, promoting the beauty of our country to every American I meet, and influencing them to travel to Canada, on this 150th anniversary. Let me share more, by winning this contest, please. I am strong, I am Canadian!